Web Marketing Association’s 2013 Legal Standard of Excellence Award Presented to Simonson Hess Leibowitz & Goodman, P.C. When leading New York medical malpractice and personal injury law firm, Simonson Hess Leibowitz & Goodman, P.C., launched its cutting edge responsive website in May, the firm’s partners knew they had a sleek, versatile website that would attract new clients. What they didn’t know was that it would win prestigious awards like the 2013 Web Marketing Association’s WebAward for outstanding achievement in website development. 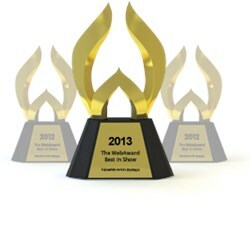 These awards are not just given out to good-looking websites. Recognition from this prestigious marketing association for my client’s website is really an honor. When leading New York medical malpractice and personal injury law firm, Simonson Hess Leibowitz & Goodman, launched its cutting edge responsive website in May, the firm’s partners knew they had a sleek, versatile website that would attract new clients. What they didn’t know was that it would win prestigious awards like the 2013 Web Marketing Association’s WebAward for outstanding achievement in website development. Trighton Interactive CEO, Jody Resnick, says his agency is very proud of Simonson Hess Leibowitz & Goodman’s responsive website and the Web Marketing Association’s Standard of Excellence WebAward. “These awards are not just given out to good-looking websites. Each website entered is judged by experts on seven criteria: design, innovation, content, technology, interactivity, copywriting, and ease of use. Recognition from this prestigious marketing association for my client’s website is really an honor,” says Resnick.